Founded in 1981, Refuge is an interdisciplinary journal published two times a year by the Centre for Refugee Studies, York University and Queen’s University. The journal aims to provide a forum for discussion and critical reflection on refugee and forced migration issues. Refuge is a non-profit, independent periodical supported by subscriptions and provides analytical, reflective, and probing articles from a wide range of disciplinary and regional perspectives, presenting writing of academics, policy-makers, and practitioners in the field of forced migration. The journal provides space for discussion of emerging themes as well as ongoing issues. Special thematic issues address the broad scope of the journal’s mandate, featuring articles and reports, shorter commentaries, and book reviews. 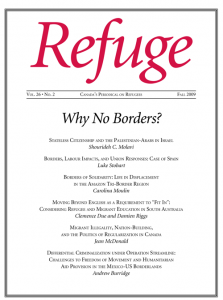 Refuge publishes articles in both English and French.